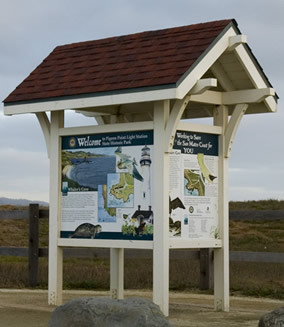 WILDWAYS illustrated designs interpretive signs, exhibits, and displays about beautiful places, remarkable events, and fascinating wildlife. Projects include historical and nature exhibits for indoor and outdoor installation in parks, museums, nature centers, and along trails. We work from client–provided content or create original content according to client specifications, including research, copywriting, watercolor illustrations, photographs, maps, diagrams, and artifacts. Our specialty is vivid watercolor illustrations that enhance the interpretive value of our work by engaging your audience with images that convey your message. Additional services include the creation of brochures and notecards to add greater outreach by using the images and messages from your interpretive plan Our projects are designed and written to be engaging, informative, and accessible, according to ADA guidelines.